You don't necessarily need the most expensive paddle on the market to enjoy kayaking. But at the same time, buying the cheapest unit will only give you a basic experience that will force you to quit rather sooner than later. We strongly recommend going with a middle option – a general paddle with a few bells and whistles, as well as some professional features. This is when our Carlisle Magic Plus Paddle review comes in to explain the pluses of one of the best rated paddles out there. Before understanding the positives and negatives of a particular model, it pays off knowing what to look for in a paddle. This decision should be made with your necessities in mind. Here is a quick recap on what we think of this paddle. Water gets trapped inside the blades occasionally. 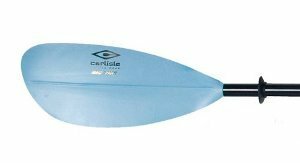 Available in two different color combinations and three sizes – 220cm, 230cm and 240cm, this model is by far the best kayak paddle from Carlisle Paddle Gear. It comes in bright colors and promises a lightweight profile and durability. This is the kind of paddle that can take a good punishment regardless of your kayaking adventure without compromising on performance and fun. Based on its materials, this paddle looks like it was designed for professionals. We couldn't leave this out of our review. The shaft is made of fiberglass. It's durable and lightweight, so you can use this paddle for hours without feeling any pain. As for the blades, they're made of high impact glass filled polypropylene. Just like fiberglass, it's lightweight, but it's also way sturdier. After all, you don't want your blades to break if you hit a rock by mistake. The high impact profile makes it suitable to any situation. Based on a series of reviews, this is one of the lightest paddles on the market – it's no surprise why. It weighs 1.6 pounds. 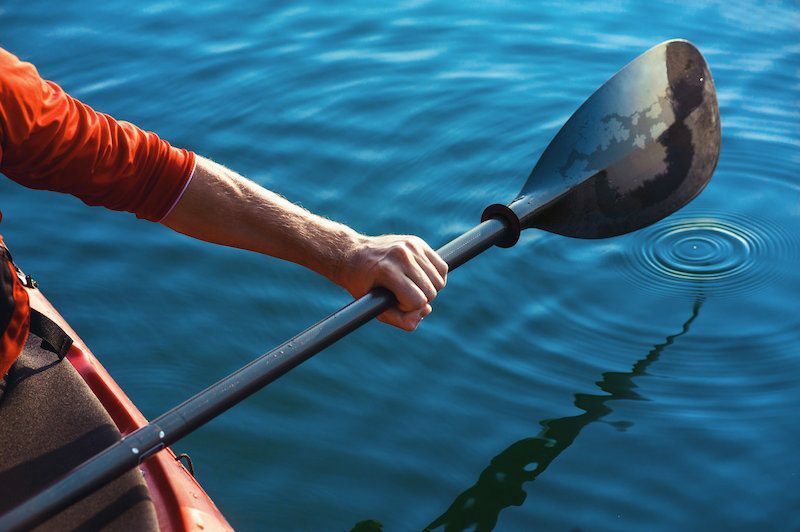 Even if this is the first time you go kayaking, you'll be able to paddle without experiencing any discomfort. The lightweight profile makes this paddle suitable to most users out there, as the strength is irrelevant. The stroke depends on multiple factors. Your strength is one of them, but the blade construction and design are just as important. This model comes with asymmetrical blades. They are high angle, so they'll provide a solid stroke. They measure 18 inches in length and just over 7 inches in width. Moreover, the blades are slightly spooned, so you have to hold the paddle accordingly. The shorter side of each blade should face the bottom, while the longer side must be up. As for the spooned design, you want the concave side of each blade to face you. Make the adjustment before you start paddling. 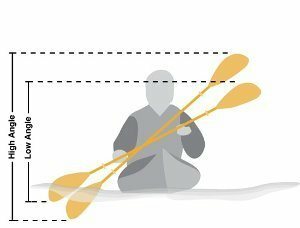 Sit down in your kayak and grip the shaft, then rearrange the paddle position for a proper operation. The right grip diameter is larger than the left grip diameter due to the extra cushion. The larger portion gives you a sense of feeling the blade without having to look at it. At this point, it's much easier to get used to paddling and keeping the kayak under control. If the shaft was round, you would have to check the blade all the time to be aware of the entry angle. It's extremely lightweight, yet it's made of durable materials. The blades are slightly spooned for a smooth and efficient stroke. Blades come apart for easy storage and transportation. It offers a good value for money. The water blocking rings might need replacement pretty soon. The use of this paddle is the main consideration before making a choice. Different kayaks come with different requirements. 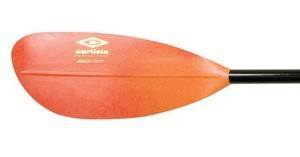 For example, a paddle designed for touring kayaks will not necessarily work with a sea surfing kayak. If you can find something suitable, fine. If not, don't worry about it. 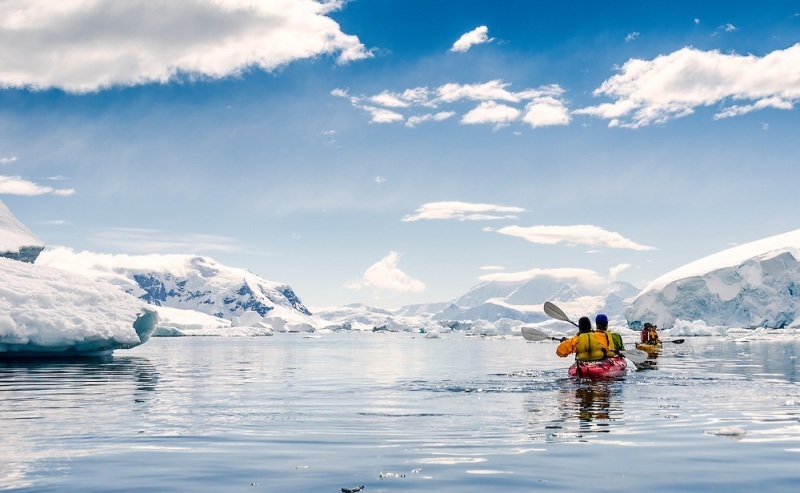 Unless you plan to join competitions, chances are you'll use your kayak for multiple activities. Your overall fitness is more important though, as it can dictate certain characteristics of the paddle. Your fitness becomes a main consideration if you're extra small or large. For instance, if you're really strong, you probably don't care too much whether one paddle is one pound heavier than another. Check out this article if you are into fishing. The shaft length is responsible for the stroke mechanics. If it's too short, you'll need a high angle and you might hit the fore deck. On the other hand, if it's too long, you'll lose power. Generally speaking, paddles go between 180 cm and 250 cm. For general uses, a 220 cm shaft should be more than enough. The blade shape may come in three different varieties. Low angle blades are long and thin. High angle blades are short and wide. General purpose blades look symmetrical – both parts are identical in shape and orientation. Materials and weight go together. The weight can make a massive difference, so always look for it when checking kayak paddles. A heavy paddle will exhaust you within the first half an hour. An ultralight paddle may also break down when it comes to rocky rivers. Consider both your strength and the waters around you. Materials are directly responsible for the weight. Carbon and fiberglass are common, durable and lightweight. Aluminum is heavier and more general. Don't overlook the final price either. At this point, you'll need to research a little in order to become familiar with the market. Different materials come with different prices. The same goes for small features, design, bells and whistles. You get what you pay for, so focus on cost efficiency. Based on our research, Carlisle paddles can easily match anyone's standards in terms of performance, quality and durability. The perfect stroke asks for a little practice and the right technique. We put together a few tips for a more efficient operation. Focus on powering the stroke with your main core muscles to prevent injuries and fatigue. For a faster movement, maintain the blade in a vertical orientation, as well as a consistent level of immersion. Try to stay upright for extra balance. Maintain the paddler's box for efficiency – a shape created by your chest, arms and shaft. Based on our Carlisle Magic Plus Paddle review, it's easy to tell what makes this paddle such a good seller. It's designed for general uses, but it also comes in several sizes and with some professional features. Up to 86% of all buyers rated it to be perfect or almost perfect. We couldn't find anything serious to complain about, so we'd rate it at 4.8 stars. Furthermore, it's quite inexpensive for what it has to offer, so it makes a cost efficient choice too.